No more driving back to check the garage door - Garadget notifies you if it was left open and you can close it right from your phone. Have you ever left your garage door open overnight by mistake? Garadget notifies you if the garage is open when it is not supposed to be. Whenever dropped off by mechanic's shuttle or returning from a jog, all you need to get inside is your smartphone. Breath a new life into your existing garage doors opener and enjoy the daily convenience and peace of mind. Get Yours Today, Risk Free! 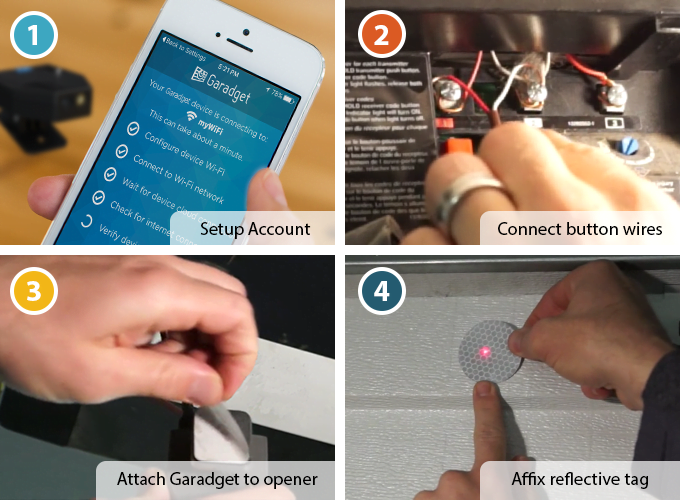 Garadget’s innovative laser sensor ends the dilemma between the maintenance free but difficult to install wired sensors and easy to install but battery dependent wireless sensors. Everything needed to set up Garadget comes in a neat recyclable package. Just add your garage door, smartphone and WiFi network. Our customers love Garadget for convenience & peace of mind it brings, ease of installation & wide compatibility, range of integration options, security & trust, great price & no monthly bill. This little device has made our lives SOOO MUCH EASIER! We love it! Love this thing. 15 minutes from opening box to controlling my old garage door via the app. Only took a little longer than that to get it added to SmartThings and integrated with my Google Home. Easiest of all smart garage door openers to install! Outstanding product. Highly recommend. Excellent invention, the best product on the market. Clear setup instruction, excellent support through the community support website. I bought two of those for my garage and both now work flawlessly. The installation took about 20 min each. Still on the fence? Contact us and we'll be happy to answer your questions and address your concerns.